From about 1929 to 1939, Martin Guitars found a sonic sweet spot. A combination of access to excellent tone woods, excellent design and painstaking attention to detail in a factory setting created a golden age in acoustic guitar-making. Guitars made in this period have had lasting appeal and fetch tens of thousands of dollars from musicians in pursuit of their unique vintage sound and from collectors who value these supreme examples of the luthier's craft. "They're extraordinary instruments," says guitar-maker Preston K. Thompson. "It's a very full, responsive, complex sound... The sound just flows out of it. It doesn't take a well-trained ear to notice it." Thompson is re-creating that golden sound in a new workshop in Sisters, located in the annex to The Belfry. The shop is up and running now, with its first guitars now coming out of production. Thompson works with fellow luthiers J. Ramey and Gareth Jenkins to build custom guitars, some on order from clients and some on spec. Dan Stewart and David Blakeslee are Thompson's business partners. Thompson has returned in recent years to the craft that built him a stellar reputation, especially in the bluegrass community. The late Charles Sawtelle of the seminal "newgrass" band Hot Rize was a friend, and helped Thompson in his 1970s exploration of the vintage Martin sound. "Charles had a great collection," Thompson recalls. Thompson studied those vintage guitars intimately, and started producing his own instruments based on the 1930s Martins. The vagaries of career took him away from guitar-building. He sold off his equipment and worked for Sunriver Resort from 1987 to 2001, part of that time as marketing director. Then he worked for Black Butte Ranch for four or five years. "After that, I decided to get back into it," he said. The Internet played a key role in the revival of his guitar-building career. People were finding his 1970s and '80s guitars, and were on the Web searching for their maker. "Those guitars were out there working for me," Thompson said. For several years now, Thompson has been making guitars out of his home shop in Bend. But he was interested in expanding his operations. "I always wanted to make more than 10 guitars a year," he said. Blakeslee, who collects instruments ("I buy 'em, I play 'em, I sell 'em," he says) and Dan Stewart decided to go in with him to create a full-scale business. "There was an opportunity," Stewart says. "You could see that this was obviously pretty scalable." Stewart, who discovered Thompson while taking guitar lessons, has done the legwork on financing and working with Economic Development for Central Oregon. The Belfry Annex location seemed perfect - tied to the arts and adjacent to a music venue. And Stewart says that the owner, Angeline Rhett, "has been dynamite." Ramey is "an amazing neck-builder," according to Thompson. He describes himself as a "woodworker since high school; a sawyer; a guitar-builder." But, he notes, he's "a musician first - everything else comes second." Jenkins moved here from Forest Grove to take up work in the new shop. He's got a background that includes apprenticeship with the legendary John Graven, who built guitars for the likes of John Denver, George Harrison and Mary Chapin Carpenter. Each luthier is capable in all aspects of the work. "You want everybody to play all the positions if you can," Thompson says. Just as it was in the Martin factory in the 1930s, everything starts with the wood. "The one piece of wood that'll make or break your guitar is the top," Thompson said. "We start with the best wood we can." Thompson has actually sourced some wood of the same vintage as the guitars that are his inspiration: Brazilian rosewood cut in 1936 and lost in a shipwreck in 1937. The wood has been salvaged and will become part of some Preston Thompson guitars (rosewood is often used for the back and sides). "It's really hard to find wood like that today," Thompson notes. "That got us a lot of attention and already sold quite a few guitars." As the crew works on producing guitars, they are also getting their shop organized and fully up-and-running. Thompson is happy to be in Sisters in a full-scale facility with other skilled craftsmen. "I do like working around other people," he says. "It's a lot more fun." For more information on Preston Thompson Guitars, visit www.pktguitars.com. Contact Thompson at 541-977-3014. 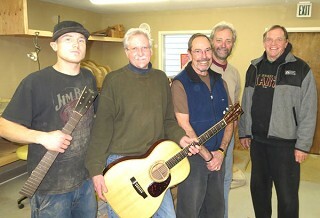 Preston Thompson Guitars is located at 352 E. Main Ave. in Sisters. The guitar-makers plan to build 25-30 guitars in their first year of operation. By the end of the fourth year, they plan to be turning out 75-plus premium instruments with the magical qualities of those 1930s Martins. The shop includes a showroom, which one day will display every model Preston Thompson Guitars makes. It will also be the venue for some guitar-picking.